Some waste types are not accepted for collection at the curb. Proper disposal of hazardous and bulk waste is important. CNWM urges all residents in Central Newfoundland to take advantage of our drop-off service. For business drop-off information, see Commercial Services. Some materials can be dropped off for free while others incur a fee. Dropping off material—whether free or for a fee—requires a CNWM Card, which you can obtain at any of our sites. Please do not dump, burn or bury this waste—it can be harmful to people, animals and the planet. Fines of up to $10,000 can be issued for illegal dumping. Residents can bring the following materials to the public drop-off area at the Central Regional Waste Management site or a transfer station during regular hours of operation. Hazardous waste includes products that are toxic, corrosive, flammable or explosive (pressurized containers). These items can cause fires, harm people or animals, and cause damage to the environment and to machinery. They are not accepted for curbside pick up. 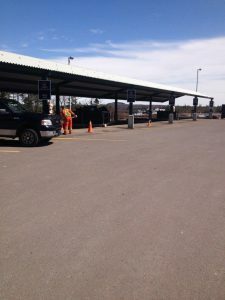 You can properly and safely dispose of the hazardous household materials at the Central Regional Waste Management Site in Norris Arm or at any of the Transfer Stations at no charge during regular hours of operation. Many hazardous products can be avoided entirely or replaced with less harmful substitutes. If you can’t avoid using some hazardous products, safe disposal is very important. Learn more about Household Hazardous Waste at RethinkWasteNL.ca. Paint is considered hazardous waste and should not be disposed of with regular garbage. If dumped into a landfill or down the drain, it can pollute the air, land and water. Many paints contain toxic heavy metals such as cadmium or lead. Even modern latex paints, though they contain fewer toxic substances, can be hazardous. But unused paint can be recycled! Find out more about accepted paint items and drop-off locations: www.regeneration.ca or call Product Care toll free: 1-888-772-9772. Rapid technology change, low initial cost for electronics, and planned obsolescence have created a major problem around the globe. Some electronic waste contains potentially harmful materials. Electronic waste also contains valuable metals and components that can be safely recycled to manufacture new products. However, if not treated properly, electronics can be a major source of toxins and carcinogens. Electronic waste is accepted at no charge at the Central Regional Waste Management Site and transfer stations as part of the Electronic Products Recycling Association’s (EPRA) Recycle My Electronics program. The following are not accepted: video game consoles, routers/modems, pagers, typewriters, cash registers, satellite dishes, DVDs, videotapes, Blu-ray discs, cassettes, and medical, automotive and industrial diagnostic/imaging equipment. For a complete list of accepted items, visit Recyclemyelectronics.ca/nl or call EPRA toll-free: 1-888-567-4535. Fluorescent light bulbs, including compact fluorescent light bulbs (CFLs) and tubes, contain a small amount of mercury and should be treated as hazardous waste and disposed of properly. Fluorescent tubes and compact fluorescent light bulbs (CFLs) are accepted at the Central Regional Waste Management Site and seven Transfer Stations. This service is provided free to residents. Looking for a place for a waste type you don’t see on our site? Visit RethinkWasteNL.ca. Bulk waste includes large items such as couches and mattresses. (Note that appliances such as washers, dryers and refrigerators can be dropped off for free as scrap metal.) Fees apply. See the detailed Fee schedule. On-road tires can be disposed of properly through the Multi-Material Stewardship Board (MMSB) Used Tire Management Program. Old tires should be left with the retailer when you change to new tires at no additional charge. Tires can also be returned to any tire retailer at a later date in manageable quantities (4-5 tires) during the retailer’s normal business hours. Tires must be in whole form, free of mud and debris, and must have their rims removed before they are returned for recycling. Find out more about the MMSB Used Tire Management Program, see a list of accepted tires or call MMSB toll-free: 1-800-901-6672. Special Wastes include asbestos, creosoted wood, pressure treated wood and international waste. All of these have specific handling and landfilling requirements. Therefore, special wastes are ONLY accepted at the Central Regional Waste Management Site. Fees apply; see a detailed Fee schedule. Looking for a place for waste you don’t see on our site? Visit RethinkWasteNL.ca.